Police say they don't know why a popular teacher allegedly fired a handgun inside his classroom, causing a chaotic lockdown and evacuation of his Georgia high school. But it immediately pierced the national debate over whether educators should be armed. As officers arrested Dalton High School social studies teacher Jesse Randal Davidson, his students spoke their minds on social media. 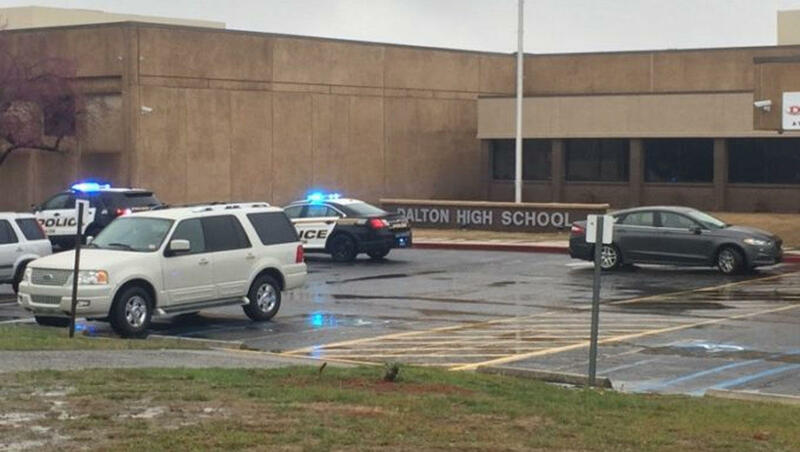 "My favorite teacher at Dalton high school just blockaded his door and proceeded to shoot. We had to run out the back of the school in the rain. Students were being trampled and screaming. I dare you to tell me arming teachers will make us safe," student Chondi Chastain wrote in a tweet quickly shared thousands of times. Davidson, 53, is accused of barricading himself inside a classroom and firing a handgun, sending students running outside or hunkering down inside darkened classrooms and a gymnasium locker room. He was taken into custody without incident after a 30- to 45-minute standoff with officers, and his motivations remained a mystery, Dalton Police spokesman Bruce Frazier said. "Mr. Davidson did not give us much information about what his motives were or what may or may not have been the problem today," Frazier said after detectives had interviewed the teacher. The social studies teacher barricaded himself inside a classroom at a Georgia high school on Feb. 28 and fired a handgun, sending students running outside or hunkering down in darkened gym locker rooms, authorities said. Twice in recent years, Dalton police say they encountered the teacher exhibiting odd behavior and wrote in one report that he "may be delusional." But Principal Steve Bartoo called Davidson an "excellent teacher" and said that "as far as I know he was fit to be at work." Classes were cancelled at the high school Thursday due to the shooting, although grief counselors were being made available and the students, who number about 2,000, were being allowed back in to recover their belongings. Classes were to resume on Friday, the school district announced. The gunfire erupted with a nation on edge following a Florida school shooting that killed 17 students and faculty and ignited a new debate over gun control. President Donald Trump, who has advocated arming teachers, convened a bipartisan group of lawmakers at the White House to address gun violence on Wednesday afternoon. Meanwhile, Dalton student Nathangel Lopez was hunkered down with classmates and teachers in a gym locker room, tweeting a photo of teens sitting on benches and called for more gun control. "This shouldn't happen to us," he wrote. "I hope a lawmaker somewhere will do something." "At first, I was thinking that that might have been a good idea. I am now totally against it," he said. Davidson himself had commented that arming teachers was a bad idea, Chastain told The Associated Press after sending her tweet. "I feel like there just shouldn't be guns at school at all," she said. "It's our basic student right to feel safe at school and if (teachers were armed), I wouldn't feel safe." "You never know what's going to cause someone to break, and maybe it will be a student who gets hurt next time," Chastain said. Police noted that Davidson didn't appear to want to hurt the students or faculty. He fired the gun at an exterior window when the principal tried to enter the classroom. "I don't know whether he was just firing the gun off to let people know to back off or what," Frazier said. However, the gunshot traveled into a hilltop neighborhood across the street from the high school campus, which overlooks part of the city, and could have struck a home or a passer-by, Frazier said. Twice in recent years, Dalton police say they encountered the teacher exhibiting odd behavior. Davidson had walked into the police department telling a rambling story about thinking a murder had occurred, but officers weren't able to verify if anything he said was true, they wrote in a 2016 report. Police said that after their interview of Davidson, he was taken to a hospital "based on him thinking about hurting himself." In another report last year, police said officers found Davidson during a school day sitting on the curb of a street, conscious but unresponsive and being held up by two school staff members. He was again taken to a hospital. Wednesday's gunfire happened about 11:30 a.m., during Davidson's planning period. Students alerted the principal after they couldn't get in. "I didn't get the door open very far, but he slammed the door and hollered 'Go away, don't come in here.' He had some nonsensical noises that were made as well," Bartoo said. Bartoo returned a short time later and put his key in the door "and again he slammed the door before I could open it and he said, 'Don't come in here, I have a gun.'" That's when Davidson fired and the school was placed on lockdown, authorities said. Davidson faces six charges, including aggravated assault involving a gun and terroristic threats and acts, jail records showed. Other charges include carrying a weapon in a school safety zone and reckless conduct. It's not clear if he has an attorney. "omg she's putting desk in front of the door," Jacobs texted to her mom. Davidson was described as laid back and smart. In 2012, he was recognized as the school's top teacher, The Atlanta Journal-Constitution reported. He moved to Dalton in 1995 and became sports and news director at WBLJ-AM radio as well as play-by-play announcer for the Dalton High Catamounts football team. "It was always about the students. He really wanted the students to understand the concept," said 18-year-old senior Rowdy Zeisig.